In 2011, Sam and I were looking to become self-employed. I had previously worked within a franchise company, so knew the benefits this could offer, and I was keen to bring my experience to our local area. The training programme was really informative, and the ongoing support doesn’t stop once you’ve finished your training, which is another benefit of being part of a franchise group rather than going it alone. We’ve been extremely pleased with the success of the business so far and have met or even exceeded the targets we set out to achieve. Sam was able to leave her employment in March 2014 to man the office and concentrate on the business full-time. 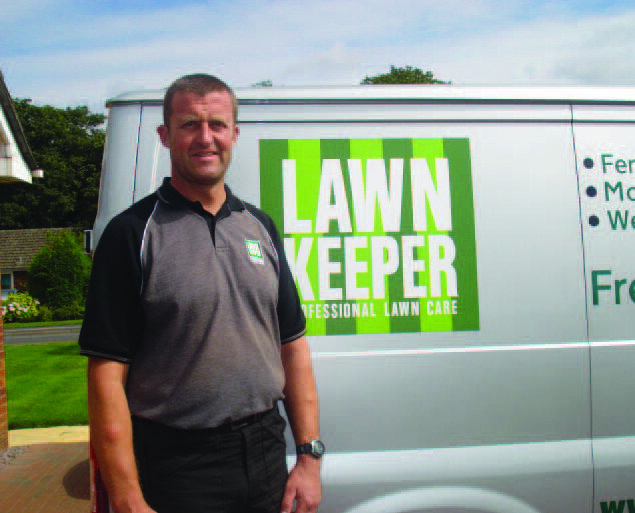 In October 2014 we also employed another lawn technician, so we now have 2 Lawnkeeper vans on the road. We plan weeks in advance so that each day’s work in an area is scheduled to be most cost-effective. There are always new enquiries to fit into the schedule, and if time permits, we may arrange a leaflet drop in the area too. We’re already slightly ahead of where we thought the business would be, so our aim for the next couple of years is continued steady growth of our customer base, whilst retaining the high quality service we provide. We are constantly looking at better ways to make our business more effective, and it’s helpful to share our ideas within the growing Lawnkeeper franchise group. We’ve come a long way in the past 6 years!